Normally I’d wait until at least the x.01 release of a new WordPress before upgrading. But this time I wanted to try the new WordPress soon after the final 3.0 version was out. I still waited a few days before installing it to let other people discover and fix any initial problems. My wait paid off as a number of people who were using the same hosting company as me (1and1) found that the upgrade was failing with a ‘Fatal error: Allowed memory size of xxxxxxxx bytes exhausted’. The fix for this problem is very simple – increase the allowed memory size, either by adding a php.ini , updating the wp-config.php, or for those who could wait a few days for an easier fix, by installing the Memory Bump plugin. I installed Memory Bump, and went through all my usual WordPress backup steps, before attempting the install. Not to panic though, this error is just saying that WordPress didn’t manage to download the new install package before its 60 second timeout. I pressed the button again, and this time it worked! 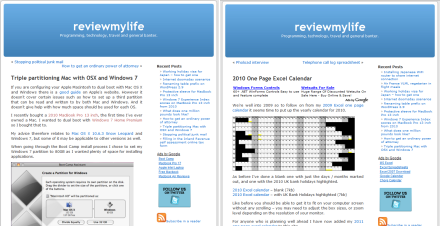 The reason I wanted to upgrade as soon as possible was so that I could give reviewmylife a new theme. The old Kubrick theme was getting a bit old. After a bit of searching and experimenting I found the News Magazine Theme 640 which I have now switched to. One word of advice if you are switching themes – if you swap to a new one, and then back to the previous you might find that all your widgets have been set to inactive. You’ll have to re-add them again. A second piece of advice is to keep any caching plugin you might have disabled whilst you play about with new themes and theme settings. This will make sure that you always see the latest generated pages, and not older cached ones. Don’t forget to turn the caching back on afterwards! Whilst modifying one of my plugins I got this error on trying to activate it. There are many possible causes, but in my case the problem was down to having opened the .php in Notepad and accidently saving it as UTF-8 instead of ANSI. I re-saved it as ANSI and it worked again. This entry was posted on Tuesday, June 22nd, 2010 at 4:07 pm and is filed under WordPress. You can follow any responses to this entry through the RSS 2.0 feed. You can leave a response, or trackback from your own site.